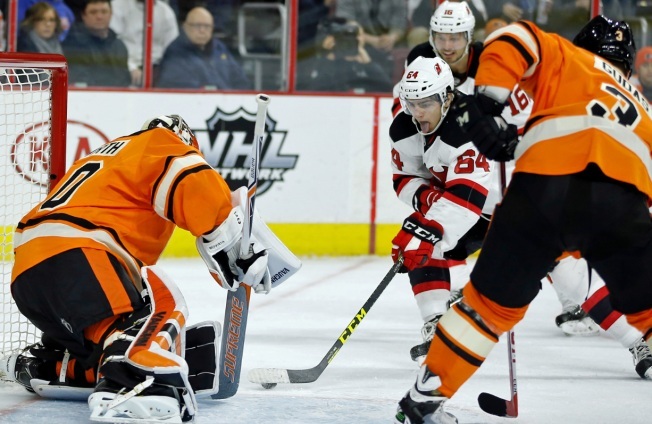 Adam Henrique scored a power-play goal 2 minutes, 58 seconds into overtime to lift the New Jersey Devils to a 2-1 victory over the Philadelphia Flyers on Saturday. Joseph Blandisi scored in regulation for the Devils, who snapped a three-game road losing streak to improve to 7-2-2 in their last 11 games. Shayne Gostisbehere scored for the Flyers to set a club record for rookies with a point in 11 straight games. After Jakub Voracek was whistled for hooking, the Devils took advantage when John Moore passed to Henrique, whose one-timer beat Michal Neuvirth. The Devils improved to 9-7 in overtime, while Philadelphia dropped to 10-10. Cory Schneider made 31 saves for the Devils. The Devils began play two points behind Pittsburgh for the final playoff spot in the Eastern Conference.